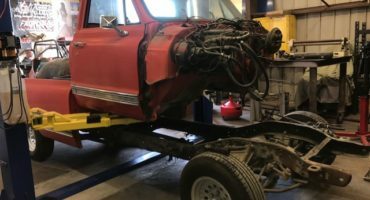 Now that the engine, transmission, front end, and cab are off, it’s time to dissect the inside. Jumping right in, I was excited to be able to see how the parts connect together, where all the different lines lead to, and how they can be disassembled. The steering column was the first part I tackled along with the wheel, which was relatively simple to remove. 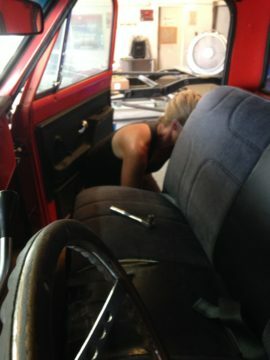 The bench seat came out next. 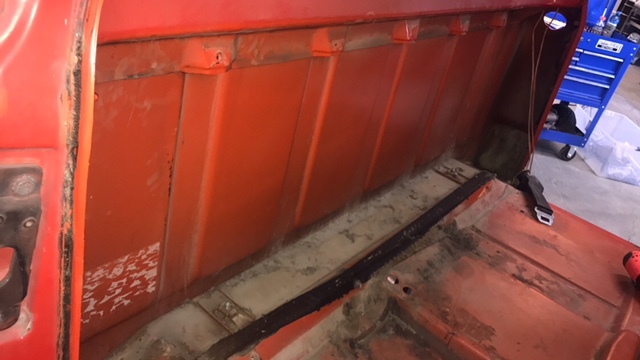 It’s in excellent condition, but is in need of a new cover, which can be easily remedied with an online visit to Brothers Truck Parts. 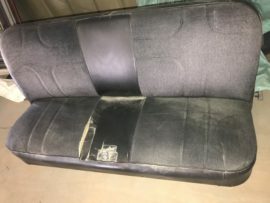 Behind the seat however, is where I found a RARE gem! 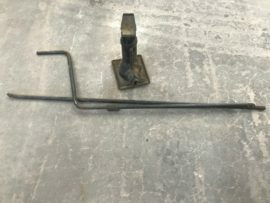 It’s not very often that you find the original bottle jack on a truck this old, and to have all the pieces for it was a bonus! The old disgusting carpet and pad were the next to go (right into the dumpster), a quick run with the Shop Vac and I was good to climb on in and and remove the seat belts. However, the seat belt bolts were a force to be reckoned with! Try as I might, I just couldn’t get them to budge, even after a shot of Blaster and the impact they were still extremely difficult. As a safety factor it is good to know that they will not come loose but for removal they were frustrating! Ever hear the phrase, “Just Google It”? 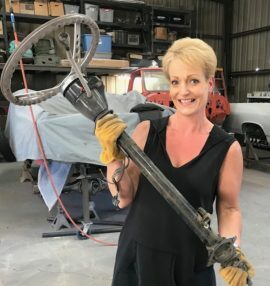 Of course you have, and in the case of rebuilding a vehicle it comes in pretty dang handy. 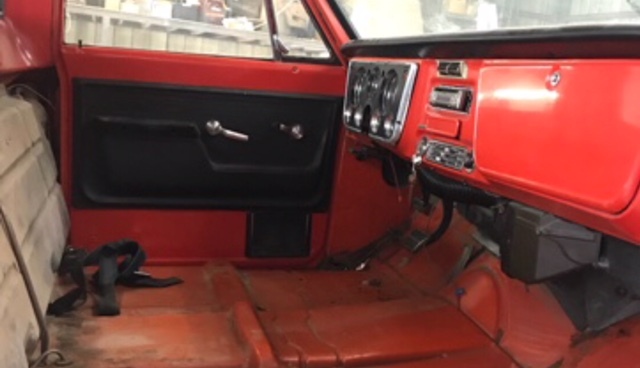 I fiddled with the ignition cylinder for maybe 30 – 40 minutes (being a stubborn woman I wanted to figure it out myself) before finally asking Big Mike how to remove it. 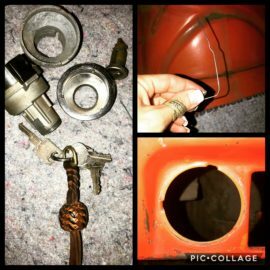 He said that ignition cylinders have a lock inside them, they usually take a small paperclip, the key, and a process of steps before the cylinder will unlock for removal. The process depends on the manufacturer, so you’ll have to Google it. When I did, the first video to pop up was on Brothers Truck Parts You Tube Channel. After watching the 35 second video and getting a paper clip, I finally was able to remove the ignition cylinder from the dash. Not everyone is blessed with having a “Big Mike” or live in an automotive shop with mechanics and body men to help answer their questions. 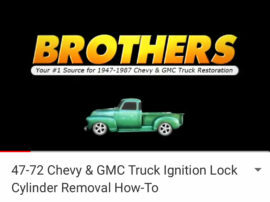 So, if you are building or restoring a 1947 – 1987 Chevrolet / GMC truck, I highly recommend subscribing to Brothers Truck Parts You Tube Channel. They have a lot of helpful and informative videos for different aspects of your project that will not only help you but also save you time and money! 35 Second Video and Done!